Today I have the honor and joy to co-host the monthly edition of The Circle with the awesome Kiki fro In Its Time, founder of the fun link-up that brings blogging gals together every month for a fun prompt and opportunity to meet new bloggers. This month's prompt takes us back to elementary school day when we were given assignments including acrostic poems. It's simple, and you can be as creative with this prompt as you'd like. Just think of different things you're thankful for that start with (or include somewhere in the word) the letters of t-h-a-n-k-f-u-l. 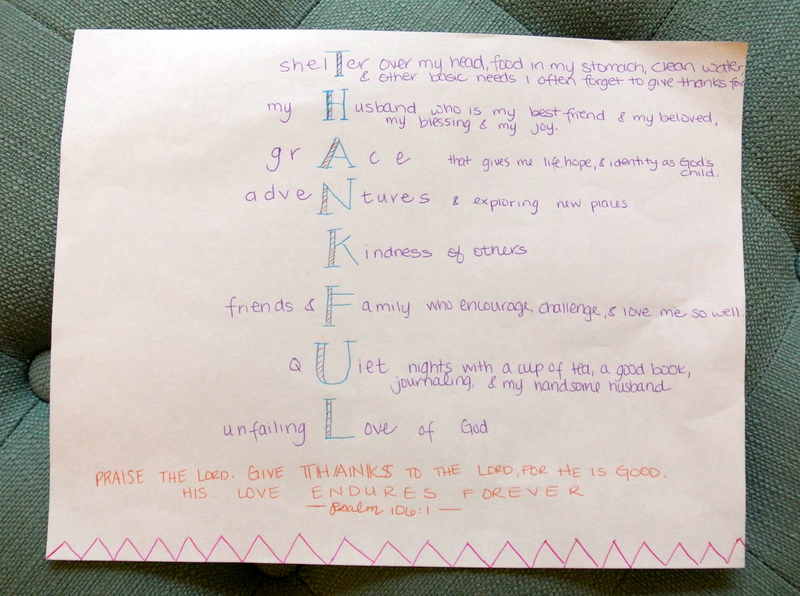 I had fun doodling with my colorful pens to create my acrostic Thankful Poem and I am so excited to see everyone else's too! What are you thankful for? Link-up today with us today, or comment below! Thanks so much, Branson!! I really enjoyed checking out your blog and look forward to following your posts more! The Circle is an awesome place for community. I am glad you found it and hope you join next month as well! Thanks so much, Shea! It was a fun project and pretty stress-relieving as well to grab my colored pens and start doodling! It brought me back to elementary school days! And YES, quiet nights are such a sweet blessing, especially for an introvert like myself! And I'm also a huge fan of your Family and Adventure words, too (plus Grace, and well, ALL of them!). Thanks again for co-hosting with me! 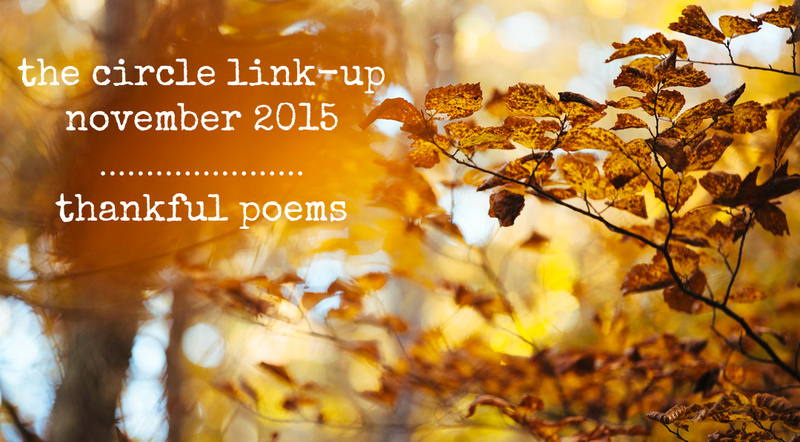 It's been so much fun to go through all of the poems! Awesome question, Kiki!! It has changed in the past 22 months of our relationship and constantly requires a lot of communication since we are both introverts! As a single, I always wondered how I'd fit quiet time into a relationship, and I have since learned it looks different for every couple and what has worked for us may not work for others, and that is fine! While dating, we were long-distance, so you'd think it would be easy (almost like being single? ), or atleast that is what I originally thought, but I was wrong. Due to my long hours at the clinic plus the 2 hour time difference, it was hard to get good quality time through FaceTime or phone calls. So by the time we'd end, I was sometime too tired to read a book or do something crafty. I was also dealing with a lot of stress and anxiety at the time too, which usually means I need more quiet time to recharge and process what's going on. Greg and I learned A LOT about communicating during the dating season and I learned that it's ok to tell him I need a quiet evening on my own without any electronics (including the laptop for FaceTime). Sometimes they'd last a few hours and Greg and I wouldn't have time to FaceTime, so we'd just text, but other times, I'd let him know I wanted an hour or so, then we'd get on FT and I'd feel really refreshed afterwards and ready for conversation. My problem was that I was coming home emotionally, physically, and mentally exhausted from working at the clinic with patients and families, so I really needed quiet time, so Greg and I learned how to fit it in, without him feeling like I do not want to talk to him. I would also use my long commute to listen to audiobooks or quiet music, while other times, when not needing quiet time, we'd chat on the phone. So it was different all the time and we just kept communicating through it all. Not to say it was always easy. As an introvert, I NEED quiet time, but when I am anxious and really stressed, I also tend to isolate myself and detach from people I love because I feel like I can't really process all that is going on so I would rather avoid it. I would sometimes use my introvert personality as an excuse to not talk about important things with Greg. "I just reeeeallly need a quiet night" could honestly be just that, but it could also be one of my excuses to avoid hard conversations and that was hard for Greg to distinguish. So, again, I go back to communication -- so key to a relationship! I learned to be OK with being honest and slowly learned to talk through my anxiety instead of detaching or avoiding, and when I said I needed quiet time, it was me telling Greg I wanted introvert time so that I could avoid getting so stressed that I am tempted to detach. So it was a healthy coping mechanism to rest my mind and heart after being bombarded all day with stressful situations, rather than becoming an unhealthy escape route from reality. I still have to check myself every now and then and ask myself what the motive behind my need for quiet time is, and Greg and I talk through it. I am sure things will change once I am working or we have kids, and that is fine. But for now, we have learned (and still learning) how we can both nurture our personality times by having quiet time as well as having really great quality time too. And it's a cherry on top that he really supports creative outlets I enjoy (like blogging!) and encourages me in making time for stuff I love! P.S. geez luise did I write a novel! Thank you SO much for this novel of a response! I for some reason forgot that Greg is an introvert as well and I think that's great because he, too, understands what quiet time means. For my 5 languages, I'm a Quality Time girl, so I not only need quiet time, but quality time with loved ones as well. I see a lot of myself in you, in that I tend to detach when I'm overwhelmed. I've found that driving in the car by myself is also therapeutic and so are runs/walks, too. Sometimes I just need to escape for a bit before I can really be open. And I LOOOOOOVE that the two of you get to spend time in quiet with each other. I really do think that's awesome and I know you both must really enjoy that, even if you're not directly talking with each other all the time. And it's kind of cool that I get to practice communication now with my co-teacher. She and I share the classroom and while I'm in charge of the college students (grading and direct supervising), we both have to work together and communicate to make things work well. It's been great practice and it's really gotten me to open up about all sorts of things which I know will help with all my other friendships/relationships, too. Love this! Quiet is my favorite as I am the same way (less a husband). Thanks so much, B! Quiet time is so needed sometimes! !